Stucco offers a variety of stylish and durable finishes which can give your home a distinctive look. It creates a great impression and enhances your home’s appeal and value. Since stucco also increases energy efficiency, many buyers now prefer homes which have this finish. Realizing its many benefits, architects, builders and property owners across Ontario are choosing stucco for their exterior walls. How Long Does Stucco Last? A common question we are asked is how long stucco lasts. The answer is gratifying. With a lifespan of 50 to 75 years, traditional stucco virtually lasts a lifetime. Let’s look at some of the other features that make stucco such a money saver for residential and commercial property owners. 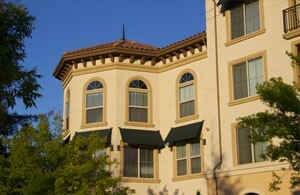 It improves the look of your home: Stucco can be applied to siding, masonry or concrete walls for a classic appearance. Since it rarely needs to be touched up and looks fresh even with minimal cleaning, you can maintain beautiful exteriors with little effort. Adds character and style: Stucco comes in a wide range of textures, such as coarse, pebbled, raked, smooth, swirled, etc. You can select one that suits your home’s architectural features to give it character and a signature style. It has custom options: Platinum Stucco can premix a specific colour that you might want for your home. Choices are unlimited, especially in synthetic stucco (EIFS) which retains colour better than the traditional material. Lasting durability: When properly applied by the trained installers at Platinum Stucco, this exterior finish can last for more than 50 years. Over time it has proven to be one of the most durable finishes for any kind of exterior surface. Stucco exterior applications are proven to have insulating qualities and help property owners reduce their energy requirements significantly. It wraps your home in a shell: Stucco forms a hard shell around your home reducing air loss and infiltration which are the main causes of high energy bills. It also resists fire, mould, mildew, rot and pests, helping preserve your home’s structure. The additional layer also adds strength to your building and has proven to be earthquake resistant. Has high R-value: Enhanced thermal resistance when compared to other exterior finishes makes it easier to maintain comfortable temperatures in your home, thus reducing heating and cooling bills. Platinum Stucco offers premium products and installation service. Our manufacturer-trained installers ensure the job is done correctly so that your can optimize the benefits your stucco was designed for. We also provide advice on selection of color and texture, as well as simple maintenance tips to keep your home looking beautiful as the years go by. To learn more about how to enhance your curb appeal and energy efficiency, call Platinum Stucco (416) 731-8600 or request an estimate online.